For the fourth consecutive days, our mileage has increased up to today’s distance of 86-miles; plus a few more miles for some members of the group who missed a turning! Another solid day of riding through this fascinating country, where we could have counted on two hands the number of cars we saw on the wide and gently undulating roads. As well as usual coastal views, it was clear to see a change in nature to a more tropical environment with lush forests and varied vegetation. We were cheered on by every school child, shop keeper and road worker we passed as we weaved our way further south to the coastal town of Chumphon. 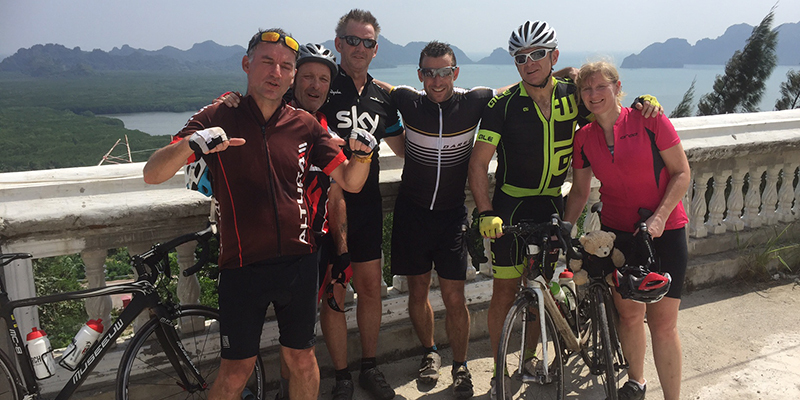 The highlight of the day was the steep (optional) climb up to the large Buddha which provided a superb panoramic view over the sea and coast line. 10 miles further on from the Buddha and we were eating another tasty lunch in a Thai wooden house gazing at the sea. Our accommodation is a perfect location for our rest day tomorrow with a small a number of rooms surrounding a large pool and just a few minutes away from the sea.